In 2013, Samuel Rigu was looking for a new challenge. Having grown up in a rural Kenyan farming family, he knew that farms in his village depended on synthetic fertilizers. On a continent where land degradation has driven millions of people out of their villages and into cities, fertilizer is often a must for farmers. However, African farmers pay two-to-six times the average world price for fertilizers due to a heavy reliance on imports, combined with high transportation costs and a dearth of suppliers in the countryside. Rigu wanted to change that. 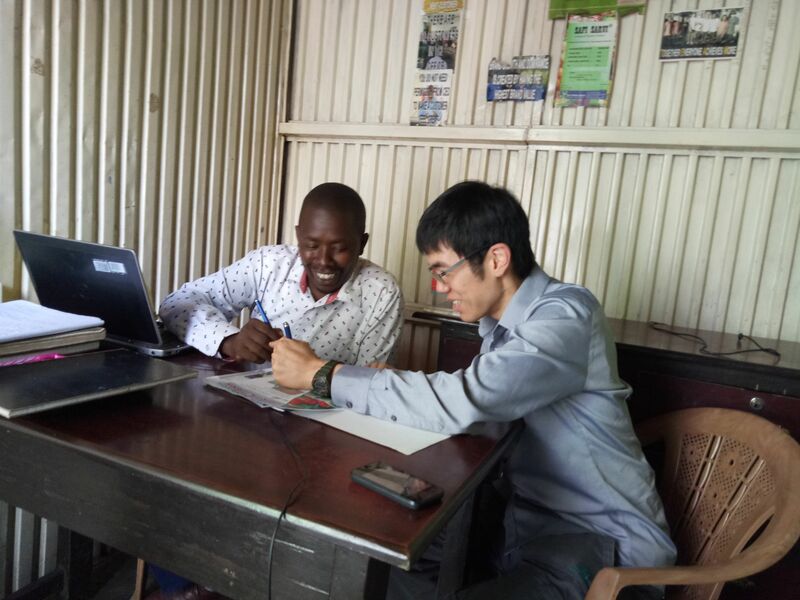 Around that time, he met Kevin Kung, a PhD student at the Massachusetts Institute of Technology, who was in Kenya to work on his thesis on alternative energy. Together they co-founded Safi Organics in 2015, a company that decentralizes fertilizer production by manufacturing at a village level, thus avoiding transport costs and import duties. Safi Organics converts farmers’ crop waste into organic fertilizer by heating biomass at high temperatures to create a carbon-rich substance, which they then mix with other nutrients to produce Safi Sarvi fertilizer. According to the company, its fertilizer helps smallholder farmers increase yields up to 30 percent through improved soil health. For every acre of land fertilized, Safi Sarvi also sequesters 1.7 tons of greenhouse gases from the atmosphere by boosting organic matter in the soil. The company won a $25,000 grant through a “Startupper of the Year” competition by Total Kenya, and currently earns $40,000 in annual revenues from a pilot project producing 2.5 tons of fertilizer per day. It has more than 2,500 customers. Rigu’s work is letting farmers stay on their land, stemming migration to cities. While rural-urban migration is a global trend, the biggest change has taken place in Africa, whose population has transformed from 14 percent urban in 1950 to more than 40 percent in 2015. While a greater availability of jobs in cities initially drove this rural exodus, land degradation has also pushed more people into cities. Safi Organics is one of 12 African companies participating in WRI’s Land Accelerator, the first startup accelerator in the world to focus on companies that restore degraded forests and farmland – from improving soil health to planting trees to optimizing harvests. The inaugural program will take place in Nairobi, Kenya from December 3-6, 2018. 245 companies applied, showing that hundreds of restoration enterprises have a strong unmet need for support. WRI partnered with Fledge, a network of impact-focused startup accelerators, to create a restoration-specific program. The Accelerator will offer training in three areas: business essentials like financial modeling, technical topics such as nursery management, and communications skills like developing an investment pitch. Asili Natural Oils is another restoration-focused startup joining the Land Accelerator. Founded in 2013 in Rwanda, Asili is a social enterprise that produces cosmetics oils by cold-pressing the seeds of moringa trees. Working with smallholder farmers, Asili recently planted 100,000 moringa trees in the most drought-affected rural areas of Rwanda. The company has created more than 40 full-time jobs and 750 seasonal positions. It has also connected 2,137 small-holder farmers to high-value international markets in the cosmetics and personal care industry. The company has a fair-trade agreement with Body Shop International, as well as other clients around the world. For these companies, the bottom line is the beginning of the story, not the end. By restoring land, these entrepreneurs not only create local jobs and fill gaps in farmers’ needs, but they also contribute to regional food and water security. And by sequestering carbon into plants and soil, companies like Asili Oils and Safi Organics make an important dent in the fight against climate change. They’re also playing a prominent role in a larger regional and international movement. African countries have committed to bring 100 million hectares of degraded land under restoration by 2030 as part of the AFR100 initiative, of which WRI is a managing partner. Research shows that halting deforestation could boost the global economy by as much as $80 billion per year, while making countries more resilient to a changing climate. Developing sustainable food and land use business models overall could be worth up to $2.3 trillion, and provide over 70 million jobs globally by 2030. To learn more about the Land Accelerator, visit the event page here.